Time and solvent can be saved using the EcoSEC GPC System with optional semi-micro columns due to the system’s low dead volume. 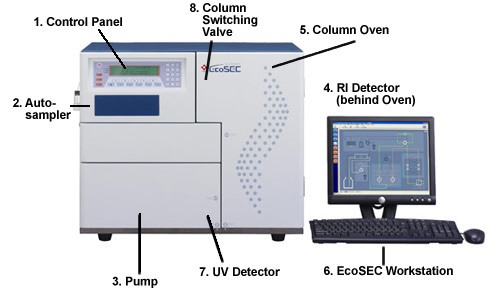 The dead volume of the EcoSEC GPC System (<20 μL) is less than half the dead volume of conventional GPC systems. Click on the individual component links below for more detailed information. Tosoh Bioscience can tailor a system to meet your application needs. Does your analysis require additional detectors beyond RI and UV? The EcoSEC GPC System provides easy and effortless connectivity when using multi-detector configurations. We offer external light scattering and viscometry detectors. PStQuick polystyrene calibration standards contain pre-mixed quantities of polystyrene polymers in autosampler vials for the calibration of GPC columns. Addition of solvent is all that is required for easy preparation and analysis. 12 different kits containing polystyrene polymers of various molar masses are available. Of the 12 kits, 9 are individual kits, each containing 3 to 5 polystyrene polymers. The remaining 3 are composite kits containing 2 or 3 of the individual kits. The concentrations of the polystyrene standards in the premixed vials vary from a low of 0.2mg/mL to a high of 1.6mg/mL. All PStQuick polystyrene calibration standards are available for reordering. For example, PStQuick Kit-M contains 20 vials each of grades C and D.
For example, grade B contains polystyrene polymers of nominal molecular weights 5,480,000 - 706,000, 96,400 - 10,200 and 1,000. In the above Table it is shown that grade B is part of PStQuick MP-H and PStQuick Kit-H.
Procedure - Simply add solvent, mix and inject onto the GPC column. Tosoh introduced its first line of TSKgel GPC columns in 1971. 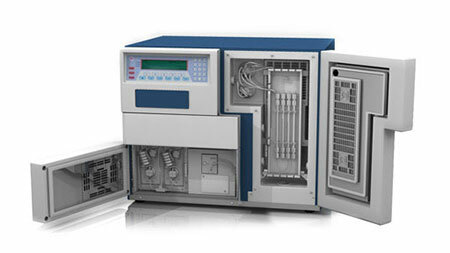 Ever since, Tosoh scientists have made important contributions to advances in polymer analysis by developing state-of-the-art GPC columns for the most demanding applications. Semi-micro columns are the TSKgel columns of choice for use with the EcoSEC GPC System. They are referred to as such since their dimensions are smaller than conventional columns in terms of internal diameter as well as in length: 4.6 mm or 6 mm ID × 15 cm vs. 7.8 mm ID × 30 cm.